In the case of Sargon they don’t even have that fig leaf. They banned him – by their own admission – for using a slur in describing Neo-Nazis on *somebody else’s Youtube channel* not even his own, when the policies of Patreon explicitly only talk about what you do *on* Patreon. They literally banned him for activity somewhere else. The CEO even admitted that he couldn’t have known he was violating their policy because it isn’t even in the policy. The bigger problem is the activists and tech giants doing this are attacking at both ends – they ban whoever they want on their own platforms, but ALSO attack their competitor platforms other ways. Patreon banned Sargon, so Sargon went to a new competitor whose name I forget at the moment. So they got that competitor black listed with PayPal. It is all very corrupt and unethical. Once banned, even if you seek an alternative, that crowdfunder would also be torpedoed, making it difficult for conservative creators to make a living. As an aside, I should say that three-time Hugo award-winning African-American SciFi author NK Jemisin‘s Patreon account allowed her to quit her day job as a psychologist and devote all of her time to writing, so we’re not talking about trivial matters. We are talking about sabotaging people’s primary income. Yep, FreeStartr is gone, and the new one (forger the name, Star-something) is already being accused of having Neo-Nazi connections. They just do it preemptively to send a signal that no one should even try to compete. Despite the wide range in differences in style, subject matter, and presentation between Milo and many of us on the right, the left does not see much distinction. I think many conservatives wonder what would happen if their words, which are often mere expressions of unpopular truth, were to invoke the wrath of the left too close to home. Far beyond simple banishment from social media, we realize our lives, careers, families, and safety could be directly threatened. 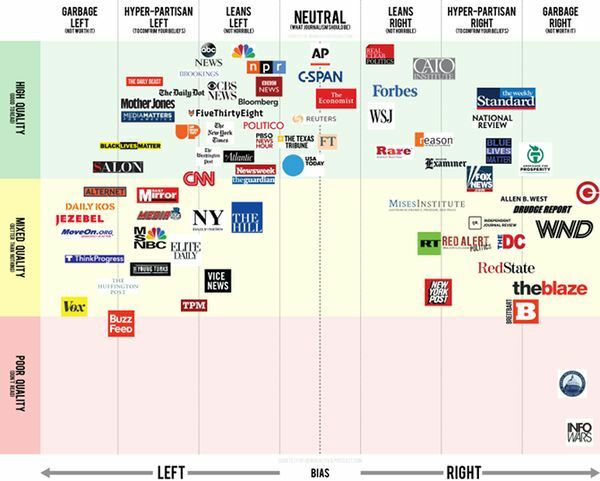 Assuming Greene’s statement can be taken as accurate, then just about anyone to the right of center could be lumped together with Milo and “the Donald,” whether we even remotely agree with them or not. If I disagree with a liberal voice on twitter or Facebook, it’s a disagreement, not hate speech, at least the way I see it. The reverse is true as well. It would be arrogant of me to believe that no one will disagree with some or all of my opinions. Only children want their way all of the time and get upset when they don’t get it. Let me take another example, this time of a Democratic Senator who tweeted something outrageous, but guess what? His twitter account is still intact. 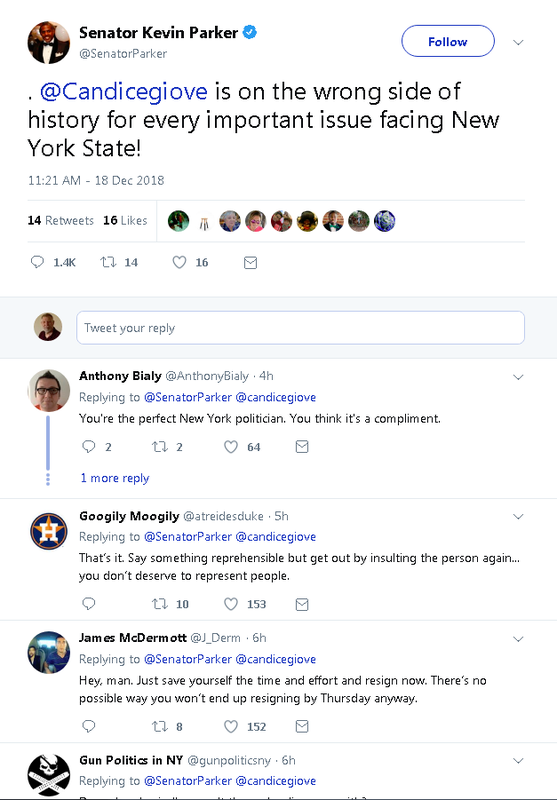 Senator Kevin Parker (D-Brooklyn) was criticized for (apparently) misusing his license plate placard by placing it on a vehicle other than the one it is registered for. 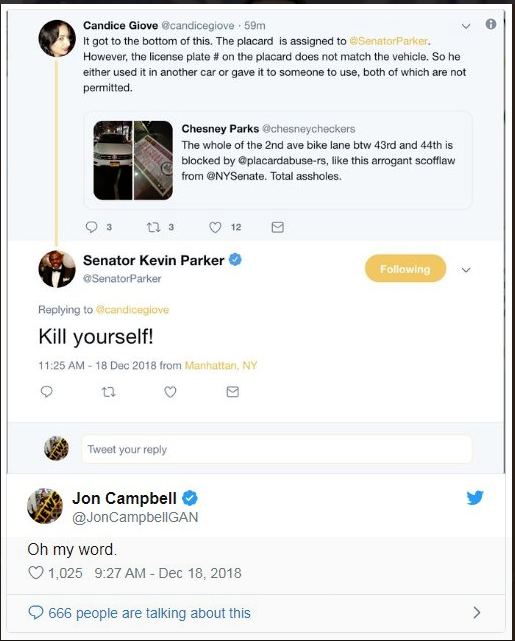 New York State Republican Deputy Communications Director Candice Giove posted this information on twitter, to which Senator Parker responded Kill yourself!. Needless to say, liberal and conservative twitter rightfully went berserk. Senator Parker deleted the tweet, apologized, but then continued to attack Giove, drawing the online ire of other Senators and journalists, as well as the general users on twitter. I don’t know if a Republican Senator would also emerge with his/her twitter account intact, but it does make me wonder. And no, again, before someone accuses me of racism, I’m not attacking Senator Parker because he’s African-American. What he said was insensitive and even cruel no matter who happened to be the source. Research has shown that some groups of people are disproportionately targeted with abuse online. This includes; women, people of color, lesbian, gay, bisexual, transgender, queer, intersex, asexual individuals, marginalized and historically underrepresented communities. For those who identify with multiple underrepresented groups, abuse may be more common, more severe in nature and have a higher impact on those targeted. I had briefly considered creating an account on twitter alternative Gab, but after doing a bit of research, discovered that the “free speech” platform is so free that it’s become a haven for every alt-right, sexist, racist nut ever to lay fingers on a keyboard (or at least that’s the perception). No thanks. Sure, probably a lot of people using Gab are just ordinary (conservative) folks who want to say things like “I think President Trump is doing a great job” or “I love the special Chick-fil-A is having this week,” but it would also be like swimming with sharks (though twitter feels that way sometimes as well). You may be wondering if I have a point. Yes, actually. I’m concerned that there is a concerted effort to silence conservative voices online. No, not racist or sexist or dangerous voices, but simply people who disagree with leftists and progressives on at least some of the issues. Even if you and I disagree on a matter of opinion, no one gets hurt, and like I said, disagreement isn’t hate speech, and it’s unreasonable to expect people to accept your viewpoint 100% of the time. But if Greene and others like him are right, how long will that last? I’m not just talking about me. I’m talking about a world where only one side of the coin is permitted to express themselves via social media, which is a huge marketing tool. I’m talking about where only liberals or progressives are allowed to make an income using crowdfunding platforms. Maybe we’re not all the way there yet, but I can see it on the horizon. Oh, and if you’re interested, you can follow Chad Felix Greene on twitter HERE. Find Sam Harris’s twitter account HERE. Maybe everyone being online is a bad idea. I don’t know. Just throwing it out there. Why are some groups protected and not others? It’s not okay to hassle someone for being gay but what about being fat? Maybe people just can’t behave. To the degree that I’m blogging and you’re commenting, we’re both online, Paula. And like it or not, it’s a big disadvantage to not being online, especially if you’re an author, blogger, podcaster, or creator of other original content. If twitter really believes that every voice is important, they and the other high tech platforms will have to start acting like it. There has been plenty of pro-Trump/conservative social media spamming. It’s part of how he got elected (only part, as he is a symptom of a larger problem or set of problems). It always amazes me when those who have used things like boycotting (hit people economically) get upset with turned tables. The tactic was only supposed to be for our side. I’m not quite sure to what you are referring. I was citing specific platforms such as twitter, Facebook, and Patreon, how they all have “right to use” agreement, and how, at least on occasion, they either misuse that agreement or are suspected of doing such. I certainly don’t argue against these platforms policing their user base and legitimately suspending or banning people or organizations that, in fact, do violate these agreements. I do, however, object to them denying access to social media/crowdfunding merely because a person or organization doesn’t fit a particular political demographic. Both sides have been guilty of censorship in the past, with the Democrats/Liberals attempting to rewrite some aspects of Civil War history, and WWII history, and Vietnam War history. Conservatives have been known to attempt to silence gays, voices deemed blasphemous to Catholics and/or Christians, and various films and shows from the 90s and earlier (all the way back to the late 1800s actually). Whoever does it, whatever the intention, it usually winds up causing more harm than good. 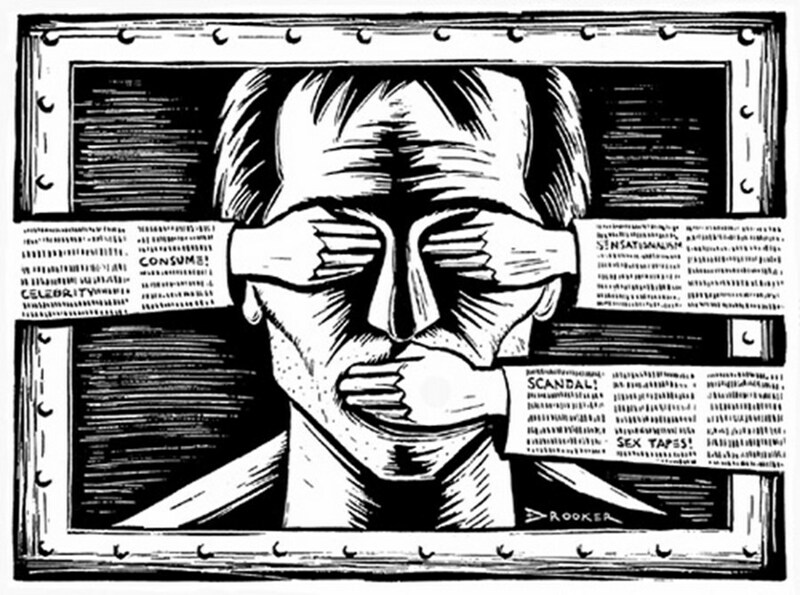 In the present day, it’s primarily liberals doing the censorship, mainly because they have the most control over the entertainment industry, mainstream news, and social media, let alone the schools.